Four people from Gitega commune in Gitega central province have been reported missing since 18 March. One had been found but was arrested by the police and went missing again the next day. Reporting. It had just rained on the hillside of Mirama in Mubuga area of Gitega commune on Wednesday 10 April around midday. Survivor of an execution after his abduction, Emmanuel Ndayishimiye has not been found since Saturday, April 6th. In the valley, the Ruvubu River, in gray color, flowed slowly. On the other bank, there is Bukirasazi hill of Shombo commune in Karusi province. On both sides of the Ruvubu, the fields were green. It was raining and some peasants took refuge under banana trees to shelter themselves from droplets of rain. All along this river, the landscape was the same up to about two kilometers at the end of a road leading to the center of Mubuga zone. There was a crowd in the area. More than twenty people of all ages were looking towards the same direction. Sadness could be read in their faces. At about 30m from the road and at about 2 m from the river, that was where the body of a man recovered from the river was just buried at around 10 a.m. According them, this body was undoubtedly that of one of the two young men who were shot dead in the night of Thursday, April 4, in this locality. The description corresponded well to that made on Friday morning by Emmanuel Ndayishimiye, a young man from Bwoga locality in the same commune of Gitega. In the morning of that Friday, Emmanuel Ndayishimiye , handcuffed and with a bandaged face, was seen by inhabitants of Mirama area who were going for their field activities. The young man, ailing, requested an emergency. He said he had just cheated death. The grave near the Ruvubu River where a corpse with the characteristics of the “disappeared people” as described by Emmanuel Ndayishimiye was buried. It was about 11 p.m. on Wednesday when Mr. Ndayishimiye was put in a car. He was blindfolded and handcuffed. Those who took him away, men in police uniforms, told him that he was going to be “transferred to Bujumbura. “Until then, He was detained somewhere in a house in Gitega province center. The young man did not forget anything about this terrible journey. While they were driving fast, the vehicle slowed down. There was a barrier. A man, certainly a policeman, wanted to control the vehicle. The other “policeman” made fun of him in a threatening tone. “How you like to control … Do you find it’s a “Hiace” mini bus for transport or a “Probox”»? Terrorized, the policeman raised the barrier to let the car drive off. A few minutes later, the car that was carrying Emmanuel Ndayishimiye took a dirt road. He got scared. He understood that it was not “a transfer to Bujumbura. “He knows the Gitega-Bujumbura road. It is tarred. He tried to remove the scarf covering his face in vain. But after several attempts, he succeeded a little and could see outside with one eye. He recognized the locality. The car had just taken the road passing through the foot of Mirama hill, near Ruvubu River. It is at that moment that he understood that everything was over for him. Beside him, he saw that he was with two other young people bandaged and handcuffed like him. The vehicle that was carrying them was of “Hilux” type. The Hilux stopped. The kidnappers took the young people out one by one. Emmanuel Ndayishimiye recognized Olivier Ndayishimiye and Térence Manirambona. All were his colleagues in an office where documents are typed and printed in Magarama neighborhood, near the center of Gitega commune. While one of the abductors opened the Hilux door, another vehicle came from the direction of Mubuga. It stopped and turned on headlights. The place where the murder was going to take place was illuminated. Visibly bothered by the unexpected car, the abductors panicked. They closed the vehicle and headed towards a car with headlights. In their rush, they forgot to block the doors. Emmanuel Ndayishimiye took advantage of it, got out of the car and ran towards the Ruvubu and hid in the reeds bordering the river. Shortly after, the kidnappers returned. They searched in the bush while making phone calls from time to time, shouting that “the mission has been accomplished except for one who has just disappeared “. At around 4 a.m., fearing that the sun would rise on them, they gave up the search. In the water, Mr. Ndayishimiye always hung on the reeds. It was at dawn that he was found in a sorry state by inhabitants of Mirama who were going to the fields. After they had listened to him, they decided to hand him to a military position based at Ruvubu hydroelectric dam. The commander of this position decided to inform Ndayishimiye’s family which lives in Bwoga area, at about twenty kilometers from the position. We are in Bwoga area. It’s on Tuesday 9 April. Emmanuel Ndayishimiye, single, is part of a family of three orphan children. He and his brother are raised by their older sister, Chantal Kwizera. Ms Kwizera, surrounded by five women was desperate. She was surprised and moved by the object of our visit. “How did you learn that?” She said after a moment of silence, visibly relieved. She told the story. He wanted to take Emmanuel Ndayishimiye with him ” for investigations ”. The military commander agreed to hand the man to him but required him to acknowledge receipt of the young man through writing. The rest of the events were like a movie. At 2 p.m. on Friday, the commander decided to accompany the family to Gitega province city center. Emmanuel Ndayishimiye was handed over to an investigation police officer. He quizzed him until about 9 p.m. and decided to release him. His health was in bad conditions, with burns all over his body and a large wound on the right leg. His family and companions left home with theirs and headed to Bwoga Health Center to seek medical care. “We were happy to find ours”. However, on their way back, they saw and recognized a car commonly known as TI in which was the police commissioner they had seen the other morning. The vehicle overtook them. Shortly afterwards, the Investigation police officer who released Ndayishimiye caught up with them. “Are you still here?» He took Emmanuel Ndayishimiye on a motorcycle to the Bwoga health center. Partial view of the town of Gitega in which Emmanuel Ndayishimiye and his colleagues spent three weeks in arbitrary detention. But the policeman didn’t say exactly where Ndayishimiye was taken. He only said Ndayishimiye “was shipped off to Bujumbura “. Since then, the family had no trace of the young man. It called the investigation police officer in charge of the file. Joined on Saturday night, he replied that theirs was not gone. He gave them an appointment for the next day. On Sunday, April 7, he scheduled another appointment with them on Monday 8 April. 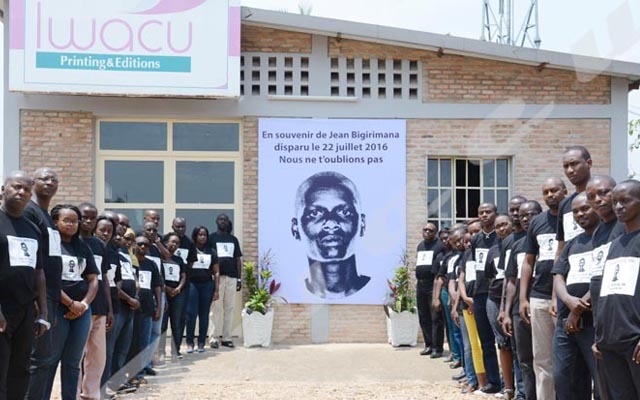 On that Monday, the investigation police officer told them that Emmanuel Ndayishimiye is “detained” in Bujumbura, without being more specific. But Chantal Kwizera insisted and the police officer told her that he would receive her on Thursday, April 11. On Thursday, he said he could not say anything about the case. “Ask the provincial police commissioner, my superior”. Emmanuel Ndayishimiye’s family tried to meet with this commissioner but to no avail. In this interval of reappearance, in the hands of his family, Emmanuel Ndayishimiye said that the day of his abduction, in the evening of March 18, he was called by Olivier Ndayishimiye, his colleague. He told him that he had just got an accident on Songa hill, not far from Gitega city center, and needed a cream. He was later on abducted by unknown people who were in a car with tinted windows while he was bringing this ointment, said Kwizera. The third, namely, Manirambona, was the victim of the same trap the next day. According to the testimonies in Gitega, Olivier Ndayishimiye had been kidnapped a little earlier, in the morning of March 18, with a certain Dieudonné Nduwayezu, a motorbike taxi rider who was driving him on a motorcycle. All four are still gone missing. Emmanuel Ndayishimiye told his family that “people I didn’t know came all the time to my detention cell telling me that if I do not give the address of my boss, Jules Niyongere, I will never be released.” The latter is a demobilized soldier from former FNL rebel movement that was led by Agathon Rwasa. In turn, the latter referred us to the police spokesman. “I have no right to give information. “After telling him why we called him, Pierre Nkurikiye, police spokesman, did not want to speak to us.